Adrian Beltre’s contract was often lumped in with other poor free agent signings because his offensive numbers in his four years with Seattle never came close to his 2004 career year with the Dodgers. But it was a good contract. Beltre provided 67.2 million dollars of value, a small premium over his 64 million dollar contract. Detractors looking at his offensive numbers ignored his Gold Glove-caliber defense at third. He averages better than 10 runs saved with his glove over the average third basemen during a season. Couple that with his league average bat and you have a very good player. The thing about that league average bat is that it would play much better away from Safeco, which kills RHBs. 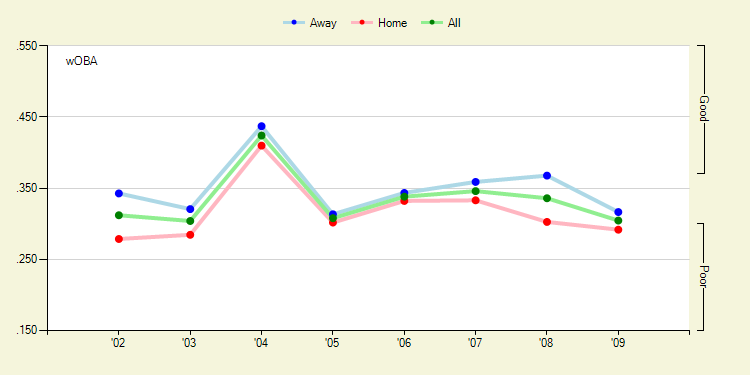 Beltre came to Seattle in 2005; check out his home/road splits since. This year he was injured and had a down year, but in the three previous he had solid away wOBAs. In neutral parks you expect a hitter to have a better home wOBA, so in a neutral home park he should outperform those already good away wOBAs. To examine this further, I looked at his slugging rate on balls in the air (all non-grounders), play by angle, for 2005 to 2009, separated for home (Safeco) and away. The lines are estimates based on the data with standard error indicated. You can see Beltre’s power is to left, typical pull power for a RHB, and that he gets more power in away parks through much of left and left-center field. The differences look slight, but many flies and lines to left over the course of a season makes up for the big difference. Interestingly, he also gets more power in away parks to extreme right field, where I had thought Safeco was a little more generous. Beltre is an excellent defensive third basemen, and in many other ballparks he should be an above average offensive player. He has the chance to be a solid free agent signing once again. We hoped you liked reading Adrian Beltre’s Bat Away From Safeco by Dave Allen! I was really hoping the Cardinals would land Beltre earlier this offseason, but I have a hard time seeing him signing a favorable deal with Boras as his agent and my understanding is that Busch kind of kills RH power also.